Signing a petition often feels anticlimactic whether the cause is just, weird, or selfish. That may partly be because sites like Change.org have made creating and signing petitions awfully easy. It can also make them easy to forget about. (Not to mention how it leaves you wondering if your signature has any impact.) New York's Blue Point Brewing saw those issues and has created a petition that's not quite as easy to forget about. The brewery has launched a petition to make Election Day a federal holiday because almost 60% of eligible voters did not cast a ballot in the last mid-term election. Nearly 35% of those potential voters said work and school conflicts prevented them from being able to vote. (Transportation is also cited as an issue.) The brewery's goal is to make Election Day a federal holiday to eliminate one major barrier many people encounter when they try to vote. The brewery released a new beer called Voters' Day Off. On one side is a label that tells you its goals. The other side is an actual petition to make Election Day a holiday, and you can sign right on the can. Blue Point has confirmed this isn't just a clever design. They genuinely intend to deliver the aluminum petitions to Washington D.C. on October 24. 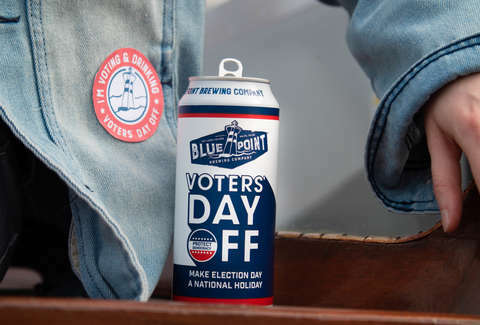 Many people who want to sign the aluminum petition will have to drop their signature online because Voters' Day Off is only available in the Blue Point taproom. It's far from the first push to make Election Day a holiday, and there are many organizations actively campaigning for the change. However, Blue Point isn't just building a petition, it's demonstrating one way to help eliminate barriers to voting. They're joining a growing number of companies that have taken matters into their own hands and are giving their employees the day off of work on Election Day. The midterm elections take place on Tuesday, November 6.